Pick a Gender: The Challenge of Designing For a Gay Wedding | HuffPost 's \"Reasons to Love New York\" and has earned her a cult following among intelligent women (and men) who want clothes that fit their minds as well as their bodies. \r\nof New York Magazine's \"Reasons to Love New York\" and has earned her a cult following among intelligent women (and men) who want clothes that fit their minds as well as their bodies. When I was a high school math teacher, I was designing clothing only for myself. I had to, since I always had trouble finding clothing that reflected my identity. Most available options were rooted in restrictive, archaic gender roles, and additionally, never fit right. When I began to design for other people, I naturally started attracting clients whose identities weren't reflected by mainstream styles, whether it was due to age, body type, or sexual identity. It made perfect sense, and gave me inspiration to commit to fashion full-time, a choice I never would have considered while I was studying physics at Bryn Mawr. I didn't start out trying to corner the market on wedding designs for queer women. When I started in 2007 there was no "market." Just LaKeisha and Paula, two fabulous women I met at New York Pride who wanted something beautiful to wear for their wedding, sans skirts. 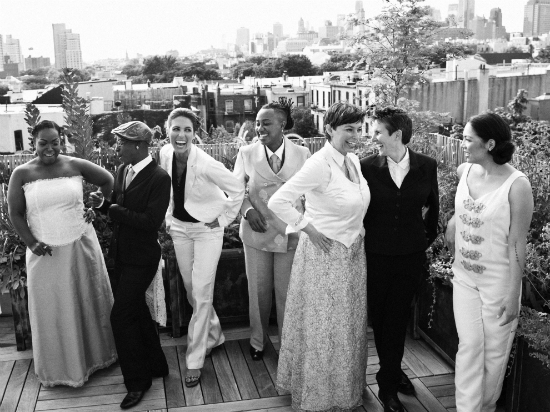 Once New York passed the gay marriage act, more and more women found their way to my door, each with their own story and a unique image of their wedding day. Some of my clients had waited for decades for the chance to commit to each other. They would sit with me and reveal parts of their personality that could never be captured by a traditional white wedding dress or tuxedo. One bride, Renee, summed up the wedding industry and formal wear conundrum: "You have to pick a gender." When two women are getting married, this just doesn't work. Dresses and tuxes are the ultimate gender-defining silhouettes. Why can't women get a little fancy pants action if they want some? We started creating something in the middle, designs with a little dress and a little tux. They were soft, feminine silhouettes with a dapper touch. Renee chose to wear pants with a halter vest that showcased her figure and coordinated with her fiancee's beautiful white dress. We could take the best of a man's suit, and appropriate it to a woman; clothing should take note of the gender fluidity that reflects how many women navigate the world today. I've heard many women, gay and straight, share their desire for a new style of wedding attire (attire being the new key word for pieces where "dress" doesn't do the trick). If you don't wear dresses, chances are you won't want to wear one on your wedding day. There are some alternatives available if you look; a fancy jumpsuit here, a pretty pantsuit there. Currently these exist as fashion afterthoughts. But that will soon change. The LGBT community has always had a strong influence on mainstream culture. Straight couples who don't conform to gender norms are gaining greater freedom to stray from traditional ceremonies. As a result, ready-to-wear wedding apparel is beginning to show the effects of gender-bending influences. The passing of gay marriage is giving everyone the opportunity to question our ideas about marriage, and see it with new eyes. We have the right to be ourselves on the day we marry. The fight for gay marriage has been a fight for equality, rights, and expansion: expansion of our too-limited definitions of marriage, family, gender, and ultimately, love and beauty.